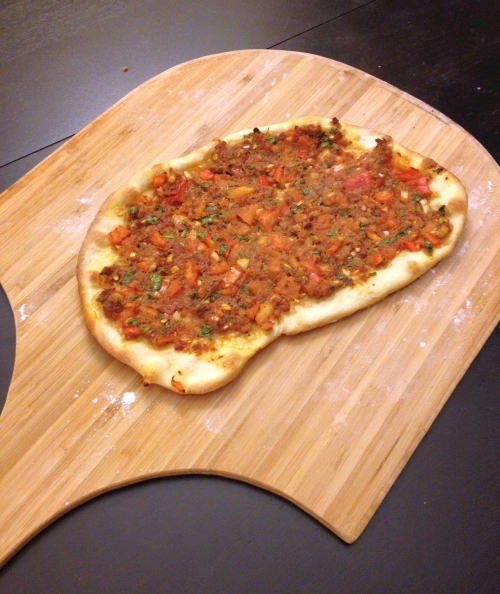 My latest iteration of lahmacun. 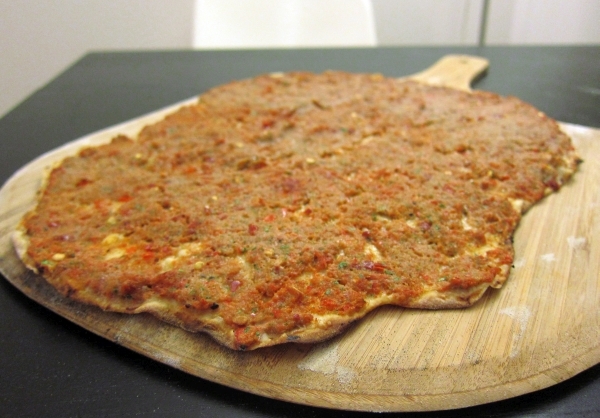 An earlier lahmacun – toppings not blended, and crust a little thicker, but no less tasty. 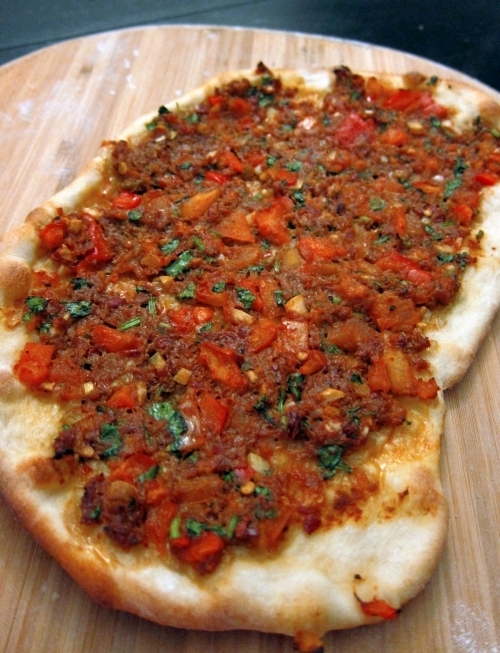 Lahmacun (pronounced “lah – ma – joon”) is a thin, crisp flatbread with a spicy ground meat topping baked directly into the crust, similar to a pizza. I know it from Turkey, but a similar dish is eaten in Armenia and in Middle Eastern countries, where it is also known as “manakeesh.” Some people roll it up and eat it like a shawarma; sometimes it is served sliced up into squares. In Turkey, when you order this dish, they serve you many pizzas at a time all stacked up, usually with some lemon to squeeze onto it. 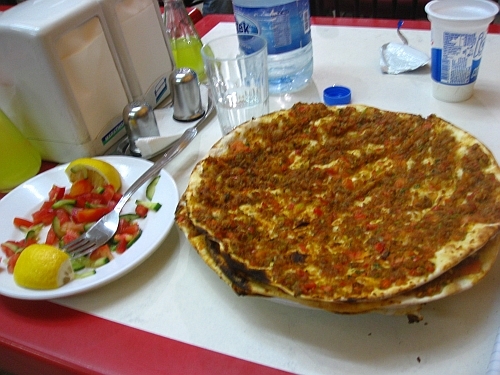 Lahmacun as served in Turkey. It’s not an Uyghur or even Central Asian food – the closest thing in Uyghur cuisine is probably gosht nan or meat nan, which is more like a pie. But it is simple, tasty, and uses ingredients you can find in Central Asian cooking: meat, tomatoes, bell peppers, chilies, cilantro. I have no doubt lahmacun would be a hit in Urumqi. Consider it a dish from the far western end of the Silk Road. This recipe is adopted from Mahmut Pişkin, who has two great Youtube videos (rolling the dough, making the topping) about making lahmacun, as well as the excellent Xawaash food blog. 1/2 lb ground meat – Beef, lamb, or a mix. Red pepper paste – This is a Turkish product and can be difficult to find. It has a sweet, smoky heat and a consistency similar to tomato paste. Middle Eastern grocers might carry it; I bought it in Kalustyan’s. Chili garlic paste, commonly available in Asian groceries, makes a decent substitute. 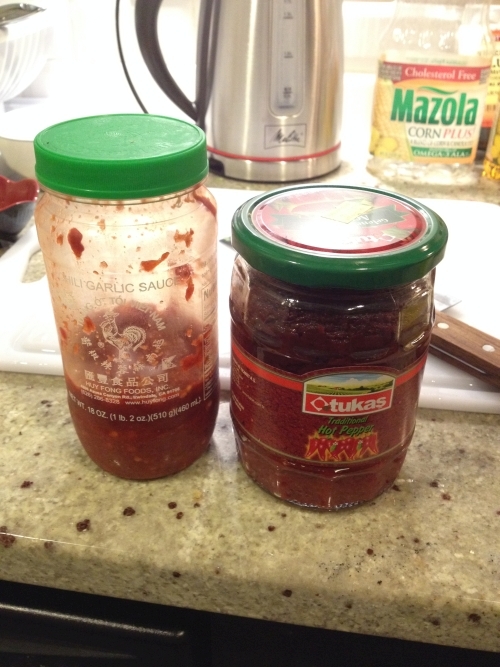 Tomato paste – optional if you use the red pepper paste and some diced tomatoes. Adds sweetness. 1. This is the standard flour/water/yeast/salt dough. In a large bowl, make a big mountain of flour, maybe one glassful. Make a depression in the flour and pour in warm water and about 1/3-1/2 packet of dry yeast. 2. 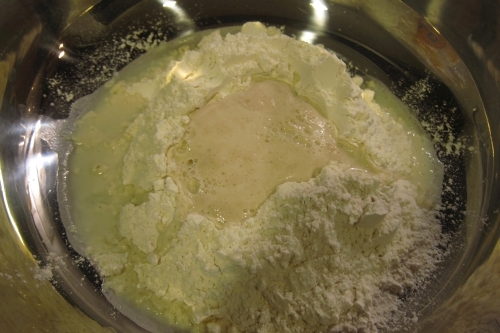 Mix up the dough, adding water or flour as needed until you have a solid mass that you can work with your hands without sticking. Knead a few minutes until it is fairly firm and does not stick to your hands. Form it into a ball. 3. 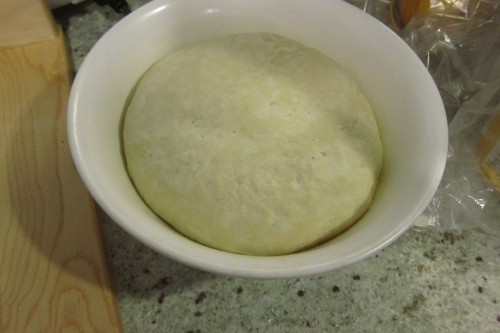 Lightly oil the inside of a bowl, put the dough ball inside, and cover with a cloth or plastic wrap. Let rest for about an hour. 1. 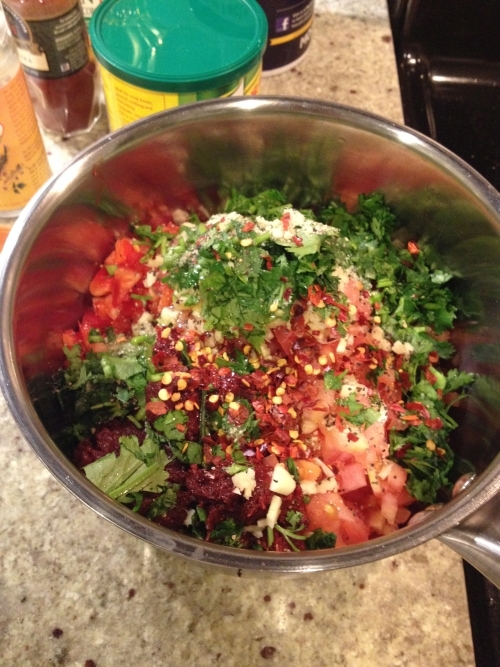 Finely dice the onions, bell peppers, tomatoes, garlic, and cilantro. You can blend these to make the topping smoother, but it isn’t required. 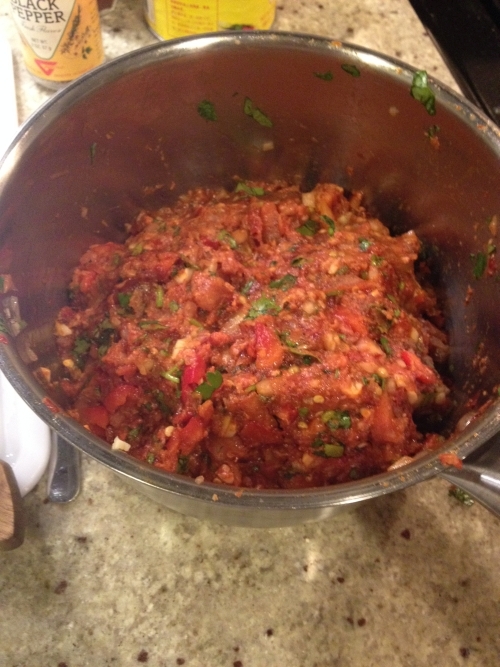 Put into a container with the ground meat. 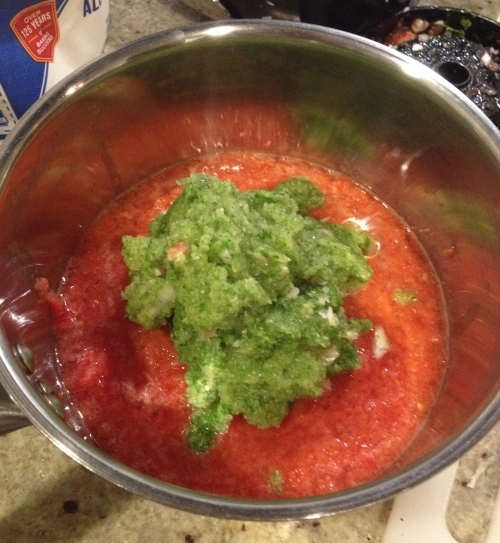 Add the salt, pepper, paprika, red pepper paste and/or tomato paste, chili flakes, and oil. Mix everything well. Pizza Making: This recipe assumes a pizza stone, but if you don’t have one, a baking pan with oiled foil or wax paper should work. 1. 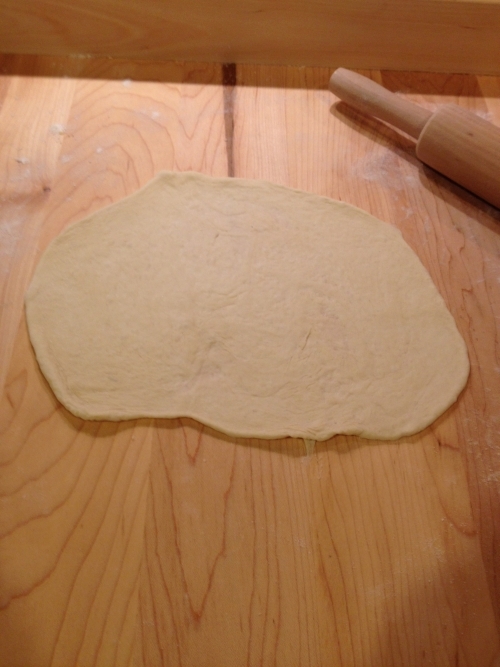 Take some dough and flatten it out on a well-floured surface. The dough should be almost paper-thin – much thinner than Americans are used to in pizza. 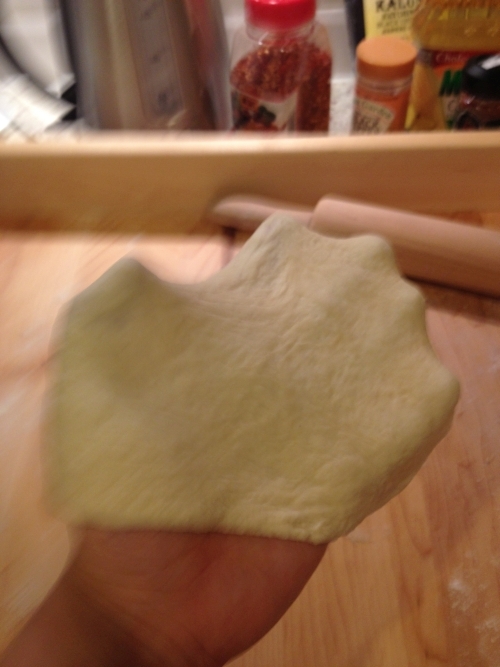 You can stretch the dough on your fingertips and toss it from hand to hand to thin it out. 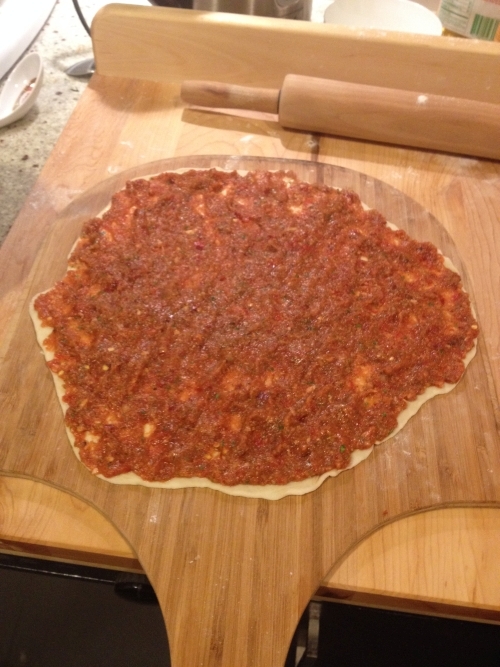 Thinness of the finished lahmacun. 2. Preheat the oven to 500 degrees F, then lower the temperature to 480 F.
3. Flour the pizza peel and put the dough onto the peel. Be very quick about the next step – the dough can start to stick if it sits too long. 4. Spread the topping onto the dough in a thin layer, pressing gently so it sticks, but not so hard that the dough sticks to the peel. It’s much easier to add the topping when the dough is on the peel, than try to move the dough with toppings onto the peel. 5. Put the pizza onto the stone. 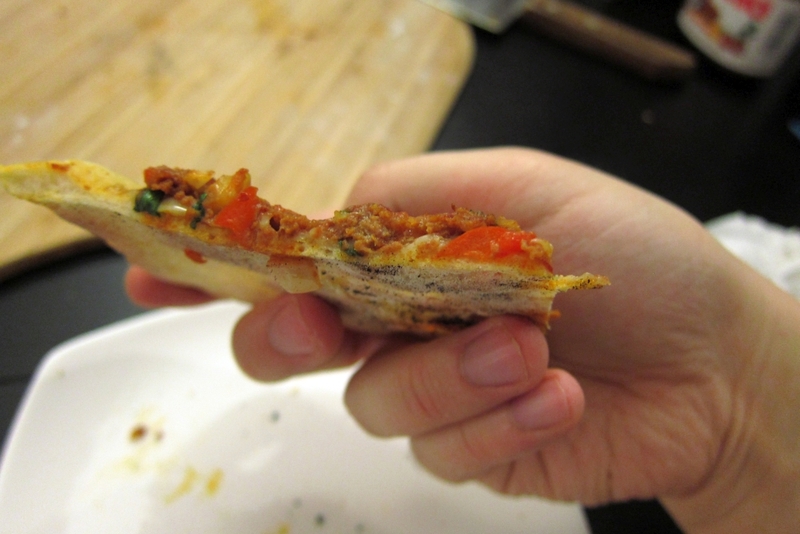 If you have never used a pizza peel before, touch the end of the peel to the far end of the stone, then lift the handle so the peel is sloping downwards. The pizza should start to slide off. Briskly shake the peel as you pull it out of the oven and the pizza should settle onto the stone. 6. The pizza bakes relatively fast – around 6-7 minutes or until the edges are golden brown and the topping has been bubbling all over for a few minutes. Serve as-is or with some lemon slices and salad. Afiyet olsun!